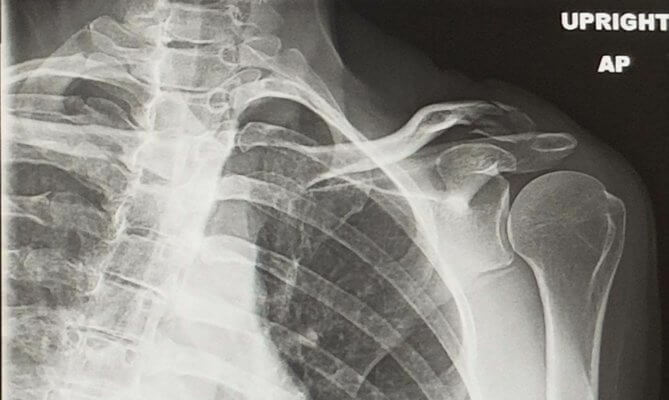 X-ray showing 3 fractures in y left shoulder. 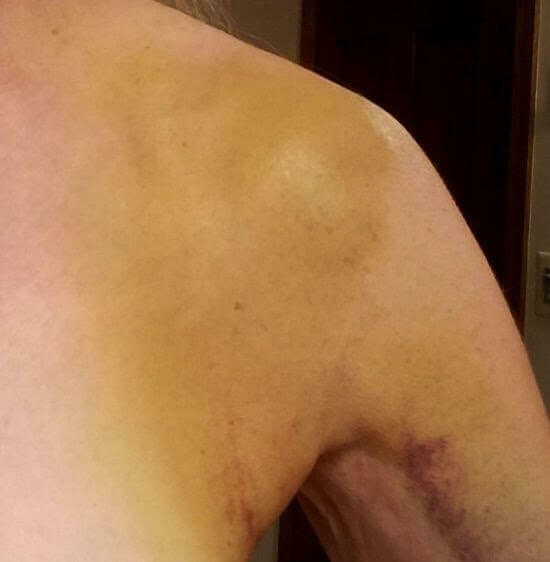 Bike accident Sept. 2018. Injured area 1 month after injury still very bruised. Dec 2018 filmed the new Upper Body Power Sculpt Workout- Arms & Shoulders in better shape than before the accident. The question is “How bad do you want summer arms?” 3X/week with 3X3FIT Upper Body Power Sculpt. I am confident this will work. How do I know? Many of you may remember that last year in Sept. I was in a bike accident and broke 3 bones in the very top of my left shoulder. See X-ray and injury below which clearly shows the 3 breaks (& my scoliosis). A very difficult place for healing due to little blood flow. Surgery was a real potential option. I began rehab 2 weeks into the injury in a sling, doing 3X3FIT daily. While I couldn’t use my left arm for 2 months and watched my arms lose their shape, once approved for more motion I began working with the 73″ Power cords. We filmed two new workouts in both Nov & Dec including Upper Body Power Sculpt. My shoulder, back, chest & arms were in their best shape yet. You can see the difference from past workouts to this one specifically. 3X3FIT was a huge part of my recovery and avoiding surgery. Working with the new 73″ power cords got my upper body into its best shape yet! Give this 30 days. I genuinely believe you will feel and SEE the results. It is an honor to workout with you and hope to bring you many new workouts though the years to help keep you motivated. What happens after 30 days? Continue! :} And, throw in 2 other 3X3FIT workouts on opposing days! DVDS will be available by end of April.